Pixologic™ ZBrush® 2019 sets the industry standard for digital sculpting. Its features enable you to use customizable brushes to shape, texture and paint virtual clay in a real-time environment. When you use ZBrush, you'll be working with the same tools used by film studios, game developers, toy/collectible makers, jewelry designers, automotive/aviation designers, illustrators and artists worldwide. Language localization - English, Japanese, German, French, Spanish, Korean and Simplified Chinese. The ZModeler brush is a new brush featuring a set of polygonal modeling functions that will allow for great freedom to take any shape and convert it into everything from an environment to parts for your next IMM brush. This new brush will give you the control to build just about any base mesh or object with as few polygons as possible. With its unique snapping ability you will also now find it even easier than ever to create holes, add edge loops or maybe even create your very own robot. The workflow is quite simple and is based on two main principles: Target and Action. The ZModeler brush has a smart set of Targets, such as a "Single Polygon", "PolyGroup" or "PolyGroup Border". These Targets remove the need to manually set selections before performing a modeling Action. As an example, if you wanted to extrude the whole side of a flat model which is comprised of multiple PolyGroups you would first select the Polygon Action Extrude, then select the Flat Island Target. Clicking and dragging any polygon located along the flat side of the model will automatically affect all polygons which are perfectly aligned with the initial polygon. The ZModeler brush contains most of the common functions found in 3D modeling packages and also has a few smarter ones like the QMesh Action. Not only does this offer you the ability to extrude but also to fuse the extrusion with any adjacent or crossed polygons. Or it can remove blocks of polygons. The QMesh Action will also move pieces of geometry or extract an area to create a new polygonal island. It's versatile and intelligent. Because some polygonal modeling actions are repetitive by their very nature, the ZModeler brush stores all settings and values used in your last Action. You can then simply click once on your selection to instantly reproduce that last operation. It works for all ZModeler Actions, saving both time and tedium! With ZBrush comes a new Dynamic Subdivision system. Traditional subdivision surfaces allow you to preview a more tessellated version of your model while editing at the base mesh level. Dynamic Subdivision provides a powerful alternative. It is comprised of three internal subdivision systems: QuickGrid, Flat Subdivision and Smooth Subdivision. These systems provide you the ability to create real-time bevel effects on your model or simply view a smooth surface aspect. Since it's dynamic, you can swap between or combine modes, even applying changes to the settings or density at any time! The ZModeler brush contains thousands of Action and Target combinations, putting astonishing power behind something that is so easy to learn and use. With just a little practice, ZModeler and QMesh will undoubtedly become a new favorite in your arsenal for creating low-res geometry assets in ZBrush. One of the main focus points in developing ZBrush has been to generate organically detailed models which look less "computer generated" or less "perfect." To achieve this, the Surface Noise system has been improved to combine noise sources. At the same time, two new functions have been implemented: NanoMesh, which goes beyond simply inserting meshes and allows the user to manipulate them on the fly, together with ArrayMesh, which is an advanced instance creation system. Combined with ZModeler, the new NanoMesh system takes the process of using ZBrush's InsertMesh to a new whole level. The 3D models inserted into a mesh can be populated based on a specific ZModeler Target. This result can then be modified in real time by adding variations to instance scale, offset, angle and multiple alignment options. If the default variations options are not enough, there is also a random distribution mode that propagates the NanoMeshes in a naturally random way across the surface of the model. These NanoMeshes are all instances of the original mesh. With this system you can edit the original mesh at any time (such as with ZModeler or even to add UV's, textures and displacement maps). These changes are then instantly applied to all instances. You also have the ability to apply multiple NanoMeshes across the same surface, giving even greater variety and artistic freedom! With NanoMesh, you will not only be able to quickly experiment with shape and form but also add tremendous amounts of detail in short order. Duplication systems that allow you to copy instances of any initial mesh have become a classic feature in modeling programs but ArrayMesh adds another level. ArrayMesh operates in real time as you edit the content of the original mesh or use TransPose action lines to adjust placement, deform the mesh (along with its copies) and much more. ZBrush also incorporates into this a multiple stage system which will allows you to stack separate Array functions on top of each other. It's so easy to create complex designs like a tank track when you can build arrays from smaller arrays of parts! Also, since ArrayMesh uses instanced geometry similar to how NanoMesh works, all objects are copied as instances. This means that you can edit the original object while your changes propagate across all the copies at the same time. Did you use an array of bolts to fasten those tank treads within the greater array that makes up its track? Edit the master bolt and every copy of it will update throughout the entire track. The ZBrush Surface Noise capabilities have been improved to support more than one noise source at any given time. Now, whether your noise is a grayscale texture or generated procedurally using the Noise plugin, all sources can be modulated with various mix modifiers and curve functions to create very unique results. Build your own library of presets and reuse them in future projects to create rich and subtle surface details. It will be impossible for viewers to spot the repeating patterns which are inherent in noise generation systems, which means that your creations will look more real than ever before. Whether you are using BPR or the ZBrush to KeyShot Bridge, you can now see procedural and texture-created surface noise rendered as displaced geometry. This process is automatic; after designing your noise you no longer need to worry about applying it before you can view the result on your geometry. All you need to do is render! This feature can also be applied to NanoMeshes. With this new technology, it becomes easy to render scenes composed of billions of polygons! Offering an alternative to ZBrush's powerful BPR powerful rendering engine, you can now seamlessly use the ZBrush to KeyShot Bridge plugin to transfer your models from ZBrush to KeyShot with a single mouse click. One advantage is that KeyShot can become a second screen for ZBrush, with your render continuing to refine and improve itself even while you are working on new elements or other projects! KeyShot is well known for combining fast speed with high render quality. Whether updating the point of view, changing the lights, swapping backgrounds or modifying the real-world-based materials, you can see the results with a speed that approaches real-time. The KeyShot workflow is also designed for ease of use, mainly based on a drag-and-drop system that bypasses the need for elaborate shader trees. KeyShot is not a replacement for BPR but rather a supplement to it. If you don’t have KeyShot you will still have the full power of ZBrush's native renderer. If you do have KeyShot, you can switch between it and BPR at any time, depending upon your needs. As with ZBrush, KeyShot relies on your system's CPU and RAM so that there is no need to invest in a high end video card to get quality renders. If ZBrush can display your model, KeyShot can render it! When the ZBrush to KeyShot Bridge is enabled, KeyShot becomes a substitute for ZBrush's BPR render. Clicking the BPR button in ZBrush will now send all data to KeyShot automatically. You won't need to worry about selecting your models, converting your noise to real geometry, generating displacement maps or anything else. ZBrush will do it all automatically! The ZBrush to KeyShot Bridge supports: ZSpheres, ZSketch, MatCaps, PolyMesh 3D, Surface Noise and more. If you can generate it in ZBrush, it can be sent via the ZBrush to KeyShot Bridge! OS: Mac OSX: 10.10 or above. HDD:8 GB of free hard drive space for ZBrush and its scratch disk. 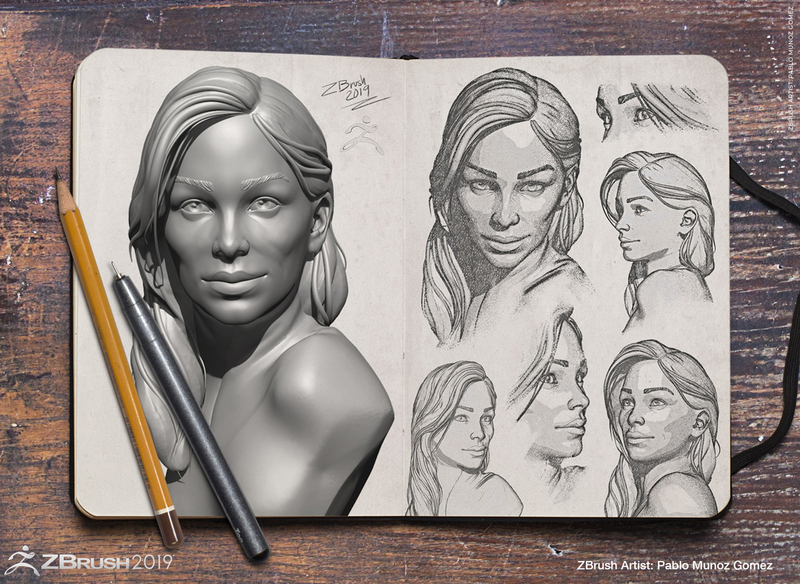 What's new in ZBrush 2019? See your 3D artwork in a whole new way with the new NPR system. Give that final 3D sculpt a hand drawn 2D style and even take your sculpted creations into the pages of a comic book. With the ability to add overlaying textures, apply a halftone printed paper style, draw a dark outline around the 3D model or apply a number of built-in presets, the new NPR system will open up an entire world of artistic possibilities. Spotlight v1.0 gave artists the capability to project any texture’s color information onto a sculpted surface as PolyPaint. It also allowed the very same textures to be applied to the surface of any model as sculptural details. Spotlight v2.0 includes all the original features and also makes it possible to convert any gray-scale image (alpha) into a 3D model. The source images can be modified or combined through Boolean-type addition or subtraction to create even more complex 3D shapes. The model generated by this system can serve as a base for sculpting or even be used with our Live Boolean system to create intricate works of art. Our automatic retopology toolset has been a key component in the modern ZBrush artist’s workflow. It now goes to the next level with ZRemesher v3.0. The enhanced sys­tems can maintain creased edges and automatically detect sharp surface angles, ideal for mechanical models. The result is also a more efficient final polygon count… with an increase in speed! The Intersection Masker plugin allows you to generate a Mask where geometry islands intersect on a selected SubTool. It’s the perfect solution for creating complex masks with just a few clicks. This slider will increase or decrease the number of SubTools visible in the SubTool list. This is merely a display setting rather than a limit on how many SubTools your model can have. It is useful for higher or lower resolution monitors. The value ranges from 1 to a maximum of 24. If the camera is too close to the object and Auto Crop (AC) mode is enabled, the 2D zoom factor will be exported as a camera sensor crop value. This color is displayed when dragging and dropping a SubTool or SubTool folder. Please read these instructions carefully in order to determine the proper upgrade steps for your system. Masking applied to active SubTool will now be visible while Live Boolean is active. Mesh dimming for unselected SubTools will now be visible while Live Boolean is active. Fixed Brushes not maintaining settings. Standard Brush now has Adaptive Size set to 0 by default. Brush Draw Size 'Dynamic' mode will now be stored per Brush. Dynamic Brush Scale (in Preferences) now allows a wider range of values. Updated GroomClumps Brush to eliminate rendering artifacts. Curve Brushes using the 'Dots' stroke now work with Lazy Mouse. Brush Classic Axis-lock (Shift modifier) will now be used when Lazy Mouse is toggled Off. Exporting textures with a VRML now supports 'Selected' mode. STL import now correctly imports color STL files. Restored missing Material shaders such as: DoubleShader, TriShader and QuadShader. Resolved issue of Best Render not working if a BPR render was canceled. Fixed UV stretching when creating Planar UV's on a model. LightBox now supports OSX Aliases. Material Blend Radius now functions correctly. Gizmo3D 'TransPose All Selected SubTools' now turns off interlaced rendering when not active. Exporting Displacement Maps in EXR format now support unicode characters. SubTool palette scroll bar no longer creates a blank SubTool List. Fixed Ghosting when manipulating models in 3D. Eliminated Layer artifacts when going in and out of Record mode. Fixed custom palette issues pertaining to sliders and shortcuts. Fixed BPR rendering issues with FiberMesh and edge detection. ZBrush to Keyshot Bridge is now compatible with Keyshot 7. Floating License Clients have been released with Patch 1. Added a "Modulate By Color" slider to NanoMesh. Boolean preference was added to allow user control to delete the temporary Make Boolean Mesh files. A Claytubes-Constant brush has been added. This will allow constant depth to the surface when a morph target is applied. A Brush3D Template Project has been added with a polygroup outline. This will make preparing VDM's easier. Updated the IMM viewer to update instantly when inserting or deleting items. IMM Viewer to turn off /on immediately as user changes the preferences settings. IMM Viewer Preferences to save with any UI config. Brushes that have been saved with older versions will have the "Adaptive Map Size” in the Brush>Alpha and Texture menu set to zero in order to be compatible with earlier versions of ZBrush. ClayTubes brush will now have Fast Samples on by default in order to be compatible with earlier versions of ZBrush. The new shift-to-Line stoke will be auto-disabled when using Smoothing brush. Updated to turn off the new Shift Line when the Shift key is pressed before touching the surface. Brush Edge action inserts by default a single edge loop instead of multiple loops. Custom palettes may now be deleted and the UI will immediately reflect the change. Button Size can now be set to max 120. This will allow for large text and buttons. Ideal for larger displays. Custom palettes can now be deleted. The font on Mac OS X should now be easier to read. All visible SubTools are now sent to the target application. 3D Print Hub will now export textures when a VRML is exported. 3D Print Hub can send to Preform and will send all visible SubTools. FBX Export now has merged UV's. The Subtool-Track of Timeline will be disabled by default in order to be compatible with earlier versions of ZBrush. The Inflate with Right Click on the Transpose Line has been removed (this will be replaced by future deformers). Pixelogic has a tutorials area called ZClassroom and they have a series of Military Character Assets with Joseph Drust, a video game industry veteran who focuses on modeling and sculpting. Below are is a link to all of their tutorials in the series, with more coming soon. 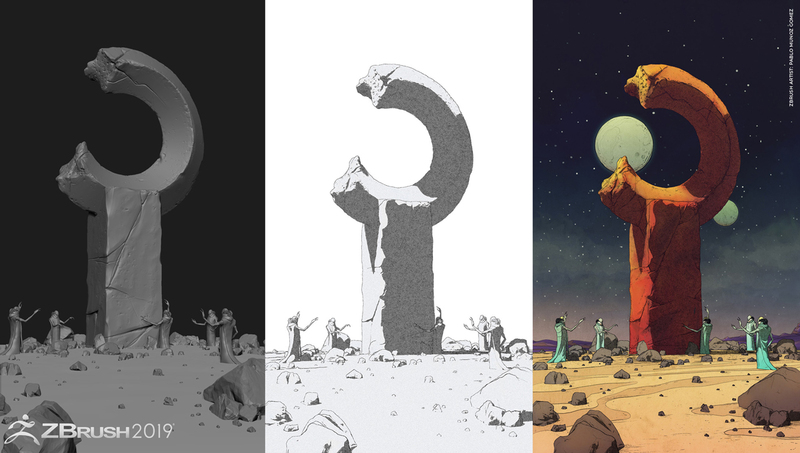 Christophe Desse has his shading and coloring techniques down to a science. A lot of people see his work and wonder how he does it so well in Adobe Photoshop; well… here is how! ZTree is a plug-in for ZBrush that provides some extra tools that can be useful when working with ZBrush. It does the tedious, repetitive steps for you.This next tutorial goes into much more depth including hotkeys, polygroups, sculpting, adaptive skin and more. Both of these tutorials were created by Dargelos Nezumi, the creator of the ZTree plug-in. Check out his YouTube page for more great ZTree tutorials. Not exactly a tutorial, but this is a great overview by Joren from the Pixel Lab, of the 3D photo scanning processes and how ZBrush, Cinema 4D and Photoshop all play a role in creating photorealistic 3D images. The Gnomon Workshop has released its long-awaited Introduction to ZBrush 4R7 video series. In this tutorial, Eric Keller shows us how to quickly add suction cups to a tentacle mesh using the new ZModeler Brush and NanoMesh in ZBrush 4R7. This tutorial will take you through the initial steps in modeling a dump truck in Pixologic ZBrush. Ten24/3D Scan Store is giving away a free full-body 3D scan of a male bodybuilder. 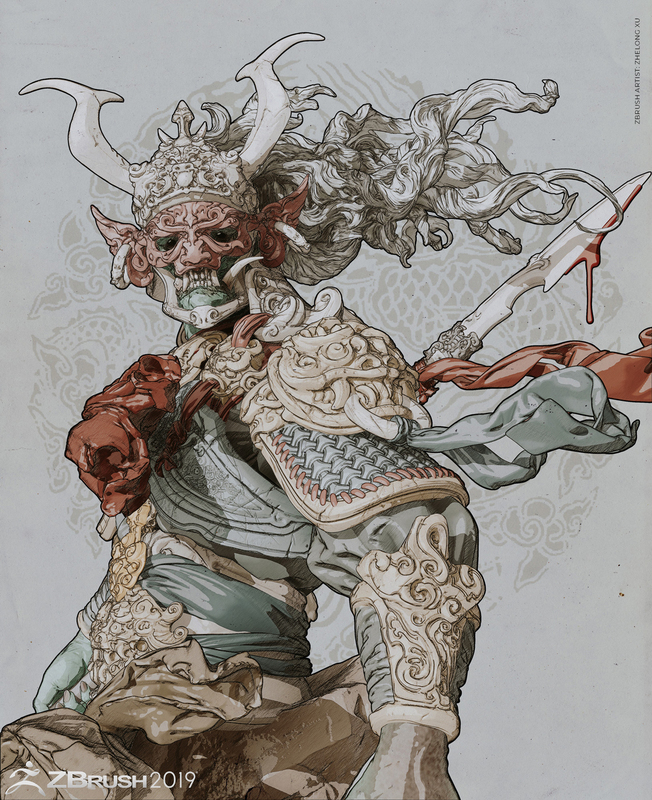 This tutorial covers how ZBrush uses texture maps and alphas together. It also features a workflow using Repeat Last to use an alpha for sculpting and a texture map for color. Learn how to use PolyPaint and groom and optimise fur by Pablo Muñoz Gómez. Riyahd Cassiem at CreativeBloq.com explains how to create Darth Vader with Pixologic ZBrush 4R8! Sculpt the helmet, cape and more. ZBrush user Michael Pavlovich has put together an entire Youtube playlist consisting of 47 videos (about 6 hours) that covers everything from opening up ZBrush for the first time, to conceptualizing a 3D bust and render setup in Keyshot. ZBrush Sculpting for Maya Users with Create3dcharacters.com. Create a cute dragon with Pixologic™ ZBrush® and learn the ZBrush interface. FlippedNormals shows you some hidden features in ZBrush that can help speedup your workflow and/or make your work more enjoyable.